These steps and arch are surviving fragments of the 1831 London Bridge designed by John Rennie and built by his son Sir John Rennie. 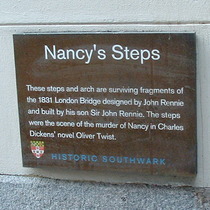 The steps were the scene of the murder of Nancy in Charles Dickens' novel Oliver Twist. 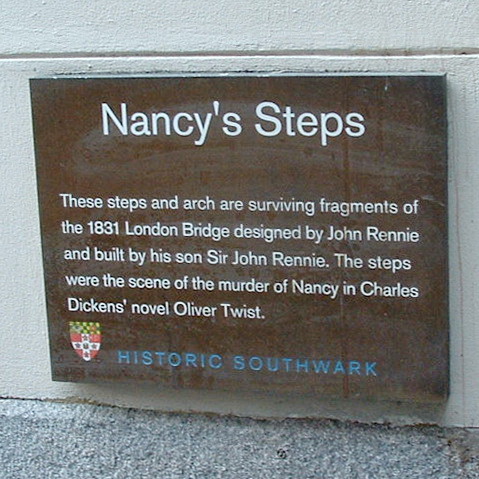 The plaque has the facts wrong; in the novel Nancy is murdered in her house. It is in the 1960 musical Oliver! that she is murdered at steps leading to London Bridge. However the steps are mentioned in the novel as explained at Lost Industry. 2016: We are grateful to Chris Harry who, via Facebook, has very helpfully provided further useful links for people who want to fully understand this Steps issue: a detailed map showing the bridge and its steps; a link to the relevant text, Ch XLVI; and a link to the sequence in the film. That really is a very thorough analysis of the issue! As you can see in our picture of the steps, by the time we got there, winter 2012, the plaque had gone missing. So we are grateful to Monkeyboy69 for having got there in time. 2016: still missing.